Not just the “issues,” but the solutions, too! Claim your FREE copy, NOW! 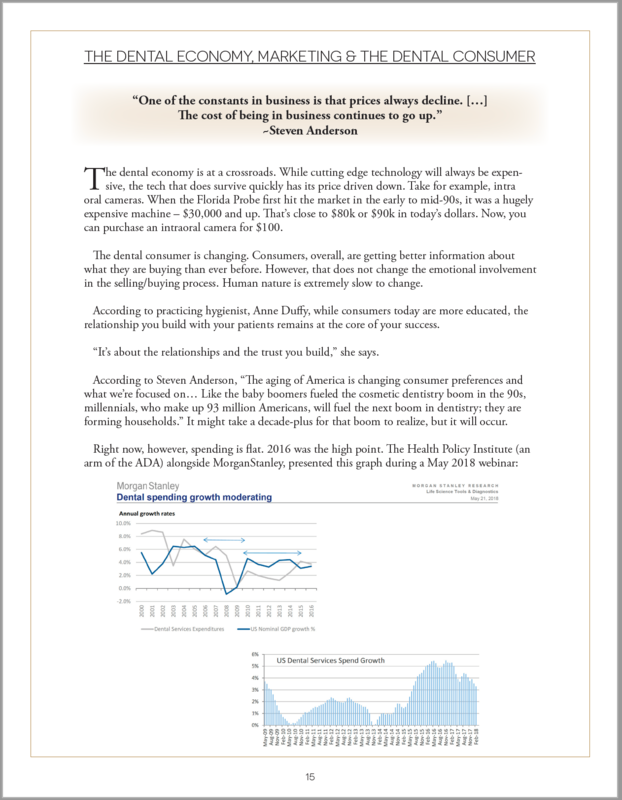 According to the ADA, the average income for GPs has been dropping or at best, holding steady for well over a decade. Most Solo GPs are working harder, longer hours, and risking more for less. If you’re a solo GP, doing really well, or, perhaps, getting beat up a bit, then what I have to share with you could well change the direction and timing of your immediate and long-term future. We’re living in perilous times, with much uncertainty. And, it’s not just you and I that face it: it’s our employees/staff/teams, our patients, and, even our government seems less than certain than ever before. All this economic uncertainty has created massive heartburn among far too many of the GPs I talk to. The tipping point is here. 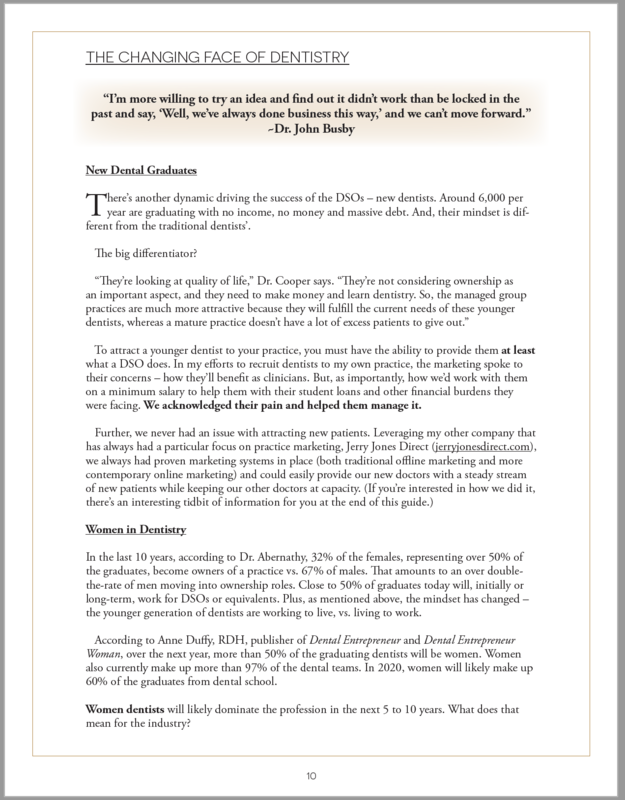 You must react, adjust, and, make sweeping changes in your practice's business model, how you practice, when you practice and, whom you practice dentistry on, if you’re to have a certain, secure and wealthy future. If you change nothing, including your own personal outlook, you’ll be easy to identify: Broke. Uncomfortable. And, struggling to make practice payments, building payments, rent, payroll, car payments, house payments, tax payments, let alone, have any money left over to build your retirement, office improvements, CE, new technology, or, the marketing of your practice that is frankly, no longer an option. 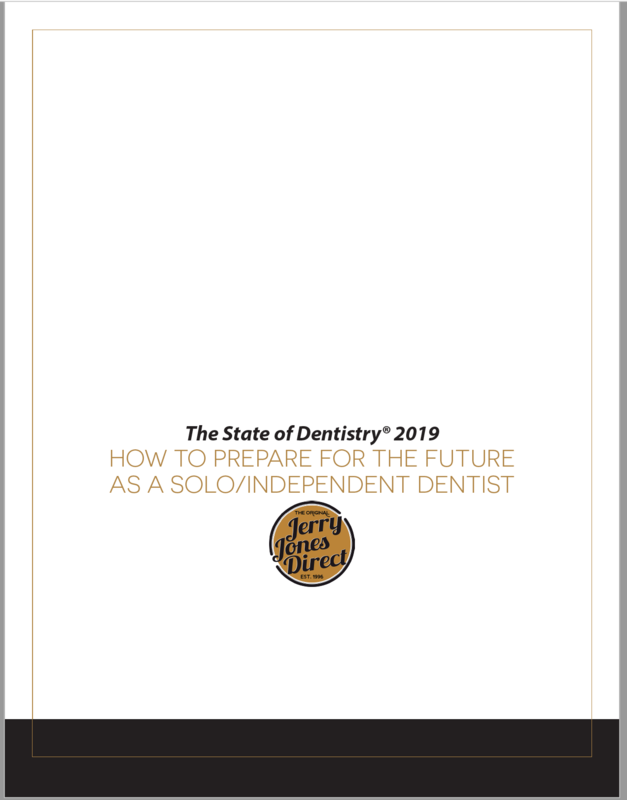 I’ve just written and am now releasing my new and updated for 2019 manuscript titled, “The State of Dentistry: The Future for Solo & Independent Dentists." Inside, I identify the challenges for which you must be acutely aware, and, how they’ll affect you in both the short-term and long-term futures. The Future for the Weak Solo GP? I also give you a comprehensive battle plan to fight back. Because, the lines have been drawn. Only the strong will survive. Anemic solo GPs, with poor business practices and lack of foresight, will, soon, be working for dental chains that will, I guarantee, permeate the landscape of every city and town in America. It’s inevitable, and, inside my report, I tell you why, and what you can do to position yourself at the forefront – becoming a champion of change and not a helpless victim eaten, chewed up and spit out a struggling wage earner with near-zero freedom. There are two types of solo, independent dentists. From my research and observation, you're either reacting to what's happening or you're MAKING things happen. I call the first one, a dental reactionary. The second, a dental visionary. In today's cut-throat, race-to-the-bottom pricing environment, you can’t afford to be a reactionary. Nor can you be one who stands on the sidelines observing the chaos. Not in this day and age. Not now. The MDs and pharmacies didn’t heed the warning signs in medicine when the big insurance companies took over. While insurance companies are only part of the issue in dentistry, there are actually much bigger players that will, eventually, control all but a small percentage of the US dental marketplace…the delivery of care, and, the money. They will exert tremendous pressure on the mightiest of GPs. Yet, even the strong, will, eventually, retire and go away, leaving a gaping hole for the big players to take over. Make no mistake. THEY know what they’re doing. They will succeed. They already are and are making massive inroads. It’s up to you to take care of yourself and those you love…all while protecting your opportunity! Because, the State of Dentistry is changing. Right now. It’s afoot. It’s not all futuristic. The manipulation is in play…there’s no stopping it. Request your 100% FREE copy now. There’s no charge. There is no obligation. 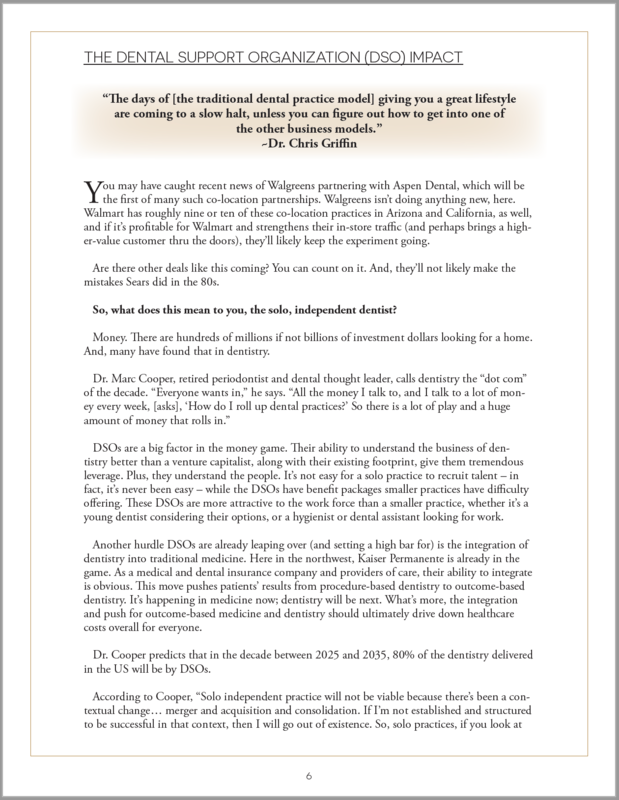 And, inside The State of Dentistry, I offer powerful solutions for those who won’t settle and give in to the control and power that is working its way through the industry right this minute. It’s all lining up. A big shakedown in dentistry is coming. You need to decide NOW if you’re in, or, you’re indifferent. It’s your choice. Get your FREE copy. Don’t delay. Just fill in the form below and click SUBMIT. That’s all there is to it. P.S This limited-release document, The State of Dentistry is available only as an online download. PS. #2 When you request your copy, you'll also receive a free subscription to my daily email newsletter, The Profit Insider. There's no charge and you can easily unsubscribe at any time if it's not for you. 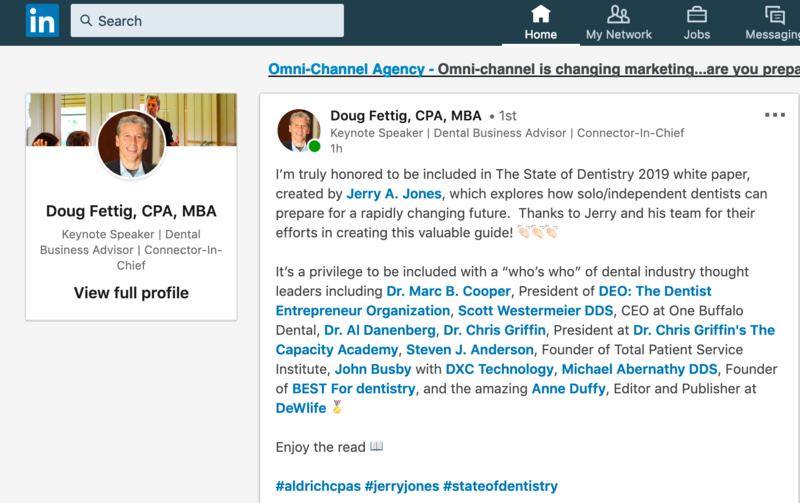 You'll find my daily email to be a dose of inspiration, actionable advice and updates on practice management, dental marketing and The State of Dentistry. Request your copy now. Don’t delay. This is far too important to set aside. Your short-term and long-term future is at stake. And, right now, I can think of nothing more important to you, than that. CLAIM YOUR FREE, limited-release COPY NOW and take action! Yes, Jerry! Please RUSH me your report on The State Of Dentistry TODAY!